A 16 year old male teen was playing with a firearm and shot himself in the arm and is in stable condition. Miami-Dade Police Det. Alvaro Zabaleta confirmed the shooting took place at a home near SW 215th Street and 90th Avenue in Cutler Bay. 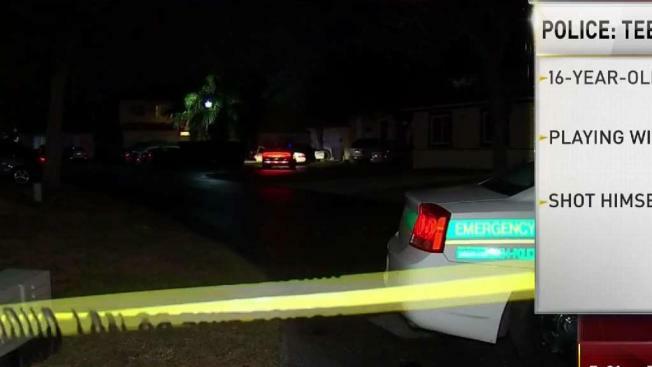 A teen was rushed to the hospital after Miami-Dade Police say he was shot in the arm after playing with a gun late Tuesday night. Miami-Dade Police Det. Alvaro Zabaleta confirmed the shooting took place at a home near SW 215th Street and 90th Avenue in Cutler Bay shortly after 10 p.m. The 16-year-old teen was hospitalized, but was listed in stable condition and is expected to make a full recovery. Officials have not released any additional details on the case.